In this conversation, Daniel Punnose, vice president of GFA and K.P. Yohannan's son, shares his thoughts about how people can truly follow the Lord. What do you see as the main thing that holds people back from following the Lord? Some years ago while listening to the radio, I came across an interesting discussion between two pastors. Part of their discussion was talking about how society pressures kids to figure out what they want to do with their lives based on their passions and interests. What caught my attention were the next few sentences. They said something to the extent of, "Parents, why don't you help your child learn to ask the question, 'What does God want me to be when I grow up?' rather than the typical question, 'What do I want to be when I grow up?'" Since that day, I have thought about that discussion on the radio many times. Isn't it true that usually, when it comes to our own future, it hardly ever crosses our minds to focus on what God would have us do with our lives or what His desires are? Rather, we tend to focus more on what we want and what our desires are. I believe that when it comes down to such a great unknown (such as our future), we are too often terrified that if we trust God completely, we will end up risking our entire lives in His hands, and we might end up being miserable. It seems more logical to us that if we are the ones in control then we have a better chance of being happy with the outcome of our future. The funny thing is, is that we know better. We know what the Word of God says about trusting Him with our lives (see Psalms 23, 37:4 and 139). From experience, we know we are most happy and at peace when we are in God's will and doing what He desires and calls us to do. Sometimes it seems like God can be so difficult to hear or figure out. What do we need to do in order to truly know God's will in our lives? In order for any of us to know God's will, we need to first have a heart of obedience. Too many times our prayers are correct in wording and theology, but the attitude of our heart is lacking. We lack the desire or commitment to actually obey what God tells us when we pray. If we truly want to know God's leading in our lives, then we need to have our minds and hearts settled and ready to obey whatever He may say, no matter how uncomfortable it might make us. Even in the prayer Jesus taught us to pray, there is the opportunity to ask that "Your will be done" in my life. It's a matter of being willing to listen and willing to surrender so He can have His way. What can hinder us from knowing God's will in our lives? Often we find it difficult to obey and do the things we already know we need to be doing in our day-to-day lives. How can God lead us in the next step of His plan for us if we are unwilling to obey the step that is currently before us? It can be something we may not even think much about, such as knowing the Lord wants us to wake up a little earlier to spend time with Him but choosing to sleep instead. Or it can be knowing the Lord wants us to go and give a Gospel tract to that person at the grocery store, or to forgive that person who hurt us, or to encourage that person who is sad. But instead of obeying, we allow our fear or our pride (or some other excuse) stop us from responding. If we practice simple disobedience and disregard putting into practice what we already know the Lord is saying, in the end we will develop the habit of listening and understanding but remain neutral in our following the Lord. We will discover that while we may have developed Biblical knowledge, we ultimately lack the power or discipline to do anything about it. It is only through simple obedience in the "small things" that the Lord can ultimately develop in us the ability to discover and follow His leading in our lives down the road. We might not always know the full spectrum of the future He is leading us in, but even one small step in the proper direction of God's leading is exactly what our hearts truly long for. This is not a mystery—God made us for His glory and pleasure, and if we follow His leading then we fulfill the ultimate purpose of our lives, which is simply to obey and worship Him. How can those of us who are older or in a position of influence help today's generation learn to discover God's will in their own lives? I believe one of the greatest things we can do is challenge the young people around us not to be pressured in figuring out their life based on what society thinks is important: their own likes and dislikes. Rather, encourage them to take time to fast, pray and cry out to God, asking Him, "Lord, what do You want me to be when I grow up?" And we should fast, pray and cry out to God right alongside them. Unless we help our young people take God seriously and be willing to trust Him with their most precious gift—their future—how can we encourage them to follow the Lord wholeheartedly in any other area of life? And this is not just true for students or young people. Wherever we are in life, whether ages 9 or 90, we need to learn to ask God to direct our future, and then commit to following whatever that might mean. We have to break free from this mindset in today's generation that we can disregard God and do whatever we want because it's "my life" and then expect Him to simply go along with our plans and bless them. Look at the men and women of history and in the Bible that we admire and look up to. They were those who were willing to abandon their lives and future into the hands of God completely and simply say, "Lord, what do You want me to be when I grow up?" No matter what age you might be, all of us can take that prayer and make it a daily part of our thinking and attitude. God is absolutely faithful in all He does, and it is through His leading that we find life and purpose—more than we could ever have experienced trying to wing it on our own. Two million rupees for a seat in college? The son of a poor fisherman could never pay such a large fee. And yet, against all odds, hope burned in Ishayu's heart. The 19-year-old approached the staff of his childhood Bridge of Hope centre. These were the men and women who had helped him study and grow for seven years of his life, who had continually prayed for and encouraged him. Ishayu shared with them the situation he now faced, and they, like they had always done, responded with prayer. In 2005, Ishayu, a young boy hungry for food and excited to improve in his studies, entered a newly opened GFA World Bridge of Hope centre near his home. "From my childhood, my aim was to become a doctor, so I worked very hard for that," Ishayu shares. "The Bridge of Hope staff helped me a lot by teaching me and supporting me through prayer." Like millions of other children in South Asia, Ishayu grew up in poverty with no way of escape. When GFA World opened their first Bridge of Hope centres in 2004, mothers and fathers could look on with joy as their children were fed, tutored and loved. Hope had arrived for thousands of "the least of these." When Ishayu graduated from the program in 2012, more than 60,000 other children filled Bridge of Hope centres across South Asia, receiving the same opportunity Ishayu had received—the opportunity to study and grow in their God-given skills and talents. By the time Ishayu graduated from Bridge of Hope, he was the best student in his school. His dreams of becoming a doctor seemed to be within his grasp. He took his final high school exams with a focus on biology and scored 97.5 percent. Ishayu might actually become a doctor. But there was a problem: He didn't make it into college. He applied again and still didn't make it. He was told he would need to pay 2 million rupees if he wanted a seat. But after his prayers and the prayers of the Bridge of Hope staff, Ishayu tried one more time and was able to enter college without paying the fee! "God heard our prayers," he said, overwhelmed with joy. Against all odds, the son of a poor fisherman had found the opportunity to become a surgeon. If Ishayu hadn't been able to attend Bridge of Hope, he would probably be catching fish with his father instead of studying to become a doctor. By offering food, medical care and tutoring to some of South Asia's most financially challenged children, we are able to give them a chance to live out the dreams they long for—and come to know God, the giver of dreams. The earth rumbled. The ground shook. The walls rattled. Pastor Tamang and his houseguests rushed out of his home as the earthquake grew in strength. But before everyone could make it out, the walls crumbled under the intensity, crushing Tamang's wife, Nirmala, beneath the wreckage of their home. After the earthquake's final tremor, Pastor Tamang found his wife lying lifeless in the rubble. Many others perished in the 6.8-magnitude quake that shook parts of South Asia on September 18, 2011. Houses and churches also fell that night, leaving survivors without shelter to guard from monsoon rains or the coming winter. Pastor Tamang lost his wife, home and church all in one night. "I can never forget such a great incident, which changed my life completely," Pastor Tamang says. Tamang was left to carry on the ministry alone. The days were difficult—especially when he'd return home, half-expecting to see his wife's encouraging smile. Nirmala actively worked alongside him, ministering to the women and children in their community. Deep down, Tamang had a feeling the Lord had a purpose in taking Nirmala, and he knew he couldn't give in to his loneliness. He knew he had to persevere, for there were still people living their days without knowing the One who sustains. He had been called here, and he would remain. "It was the grace of the Lord Jesus Christ and the prayer support of my believers that helped me to stand firm after the death of my wife," he says. "God comforted me so I can continue my ministry." In the years that followed, Tamang pressed onward. His church congregation, made up of 66 believers, helped him whenever he'd go out for ministry. They'd talk to people and build relationships, hoping to introduce them to the love of the Saviour. It wasn't easy. Most people in the remote, mountainous region where Pastor Tamang serves aren't open to hearing about Jesus. "The moment we talk about Jesus," Tamang says, "people become very resistant. They stop listening to what you are saying." But Tamang prays and keeps on. Slowly, incrementally, people are responding. "Because of the resistance we face from the people here, ministry here does not grow fast," he says. "Because of this problem, we feel that by flesh and blood, we cannot conquer this. … I urge you to pray for our ministry here." Tamang also requests prayers for a life partner in the coming days. "It is very difficult to serve alone," he says. But he continues on with the sweet memories of Nirmala and the knowledge that God is faithful—and He has a purpose for all He allows to happen in his life. Laveneet was a teenage bride. Her husband's family knew she was a Christian, but they thought she would change after the wedding. When she didn't, her mother-in-law, Rupa, started scolding her and even stopped the young woman from going to church. Once, after Laveneet's pastor and a few believers visited her, the family beat her badly. Even when Laveneet would see them on the street, she couldn't talk to them; if she did, her in-laws would punish her. Laveneet lived in this near-isolation, surrounded by critical voices, for more than two years. But each day, she would secretly read Scripture and pray, and the Lord sustained her. While her mother-in-law oppressed her, Laveneet's husband, Madur, looked on. He noticed Laveneet never said anything derogatory about his mother. Instead, she prayed for her. When he would get drunk and slur Laveneet, she didn't get angry. No matter what problem she faced, Laveneet wouldn't argue or complain; she'd simply pray. And her faith in her God stood strong. "I can change everything [about myself to serve you], but I cannot deny my God," Laveneet would say to her husband and in-laws. The words, as kind and as bold as they were, touched Madur's heart. He didn't forget them. The whole time that Laveneet was cut off from fellowship, her church was praying fervently for her. 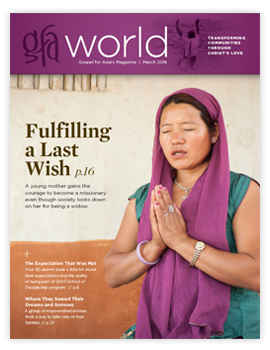 An email even went out from GFA World's U.S. headquarters, and believers around the world prayed for Laveneet. And the Lord answered. As Madur watched the suffering of his wife under the opposition of his mother, he decided he would move them out of that house. Laveneet was free from the negative comments, and she could go to church again! But life still had its difficulties. Madur and Laveneet's only source of income was selling chickens, and their flock was too small to be a sole source of income for the couple and their two young children. The family struggled to get by, and they often went hungry. "Do not worry," Laveneet would say to her husband. "One day God will raise us up [from our poverty] if we depend on Him." Madur began to pray with his wife to God. As he prayed, he learned to trust in the Lord, and eventually he decided, even against the will of his mother, that he wanted to entrust God with his life. The Lord continues to be faithful to the young wife who walks through the church door with her husband and children each Sunday. There are others like Laveneet who live under oppression from their families, even their own spouses. These believers' faith is a source of contention, but it's also what sustains them. Please pray the Lord gives His children strength and helps them to be a pure reflection of Himself. Pray also for believers' unsaved spouses, that the Lord will reveal Himself to them, as He did for Laveneet's husband. The apostle Paul wrote a very personal, affectionate letter from prison to the Christians in Philippi. He longed so much to see them and was praying for them all the time. They were so dear to his heart that he called them "my joy and crown" (Philippians 4:1). In New Testament times, Christianity was a close-knit community of small fellowships. The believers were often rejected from their families and severely persecuted by religious and secular societies, and thousands of them died as martyrs. Believers depended on each other for fellowship, support and encouragement in following Jesus. Their love and commitment for one another was very precious to them. In those days, for someone to receive Christ bordered on social suicide because people lived in joint family units. They depended on each other for their livelihood, love, support, security and future. Imagine that out of 20 family members only one came to know the Lord. What pressure, pain, mockery and rejection he or she had to endure. For such a lonely, suffering believer, the church was his place of joy, love, comfort, acceptance and family. With this backdrop in mind, the apostle Paul wrote about a major concern he had on his heart: "I implore Euodia and I implore Syntyche to be of the same mind in the Lord" (Phil. 4:2). The two women were good believers and had shared Paul's struggle for the Gospel, but something happened between them that affected their love for each other and disrupted the unity of the church. Paul didn't say what their problem was, but from his exhortation about letting your mind dwell on good things (Philippians 4:8), we can conclude that it may have been misunderstandings, listening to gossip or imagining negative things about each other. Paul asked the leader of the church to help these sisters to make peace with each other. The world is full of darkness. We cannot change or control what happens around us. We also can't stop outsiders from misinterpreting the Good News of Jesus and creating problems and confusion for the work of God. The crisis we face is not the darkness out there; it's the one inside the church, the things that divide believers, and destroy their love for one another and the unity among God's people. To name just a few: secret jealousy of a brother's or sister's position or gift; disappointment because someone received recognition and we didn't; blaming others for our own failures; resentment of a correction or well-meaning counsel; or listening to and believing negative reports. Paul urges the two women in Philippi—and us—to live in harmony with each other. This will not happen unless we start taking responsibility for our own hearts. Unless we walk in humility like Jesus, our Lord, we will never be able to rejoice when others are blessed or recognized. We will also never take responsibility for our own failures, and we will not benefit from any correction or counsel, even if it were given by the apostle Paul or Jesus Himself. Unless we love others with Christ's sacrificial love, we will never stop listening to bad reports and passing on negative information and gossip about others. How do we take responsibility for our own hearts? We must learn from Jesus to deliberately choose humility instead of trying to fight for recognition, power and position. Let God be the One to lift us up in His own time. We must honestly examine our motives and why we say what we say and act the way we act. Many times we cleverly cover up our secret agendas, resentments and offences with a smile and nice words. If we don't deal with such un-Christlike motives, we will not be able to walk in the light with our brothers and sisters, and the love we once had for them will become cold, or worse, turn into hatred. We must watch diligently what we permit to enter our lives through our eyes and ears and what we entertain in our minds. It will affect our hearts and our walk with God and easily poison our relationships with our brothers and sisters. We must tell those who come to us with the "latest news" about others: "I don't want to hear it." For the protection of our own hearts, we must practice what Paul told the Christians in Philippi: "Whatever is true, whatever is honorable, whatever is right, whatever is pure, whatever is lovely, whatever is of good repute, if there is any excellence and if anything worthy of praise, dwell on these things." (Philippians 4:8) (NASB). Practicing this will automatically filter out the things that destroy the love and unity among God's people, which is the greatest testimony we have in this world. My dear friend, for the sake of a world that is waiting to hear about the Saviour, let us take responsibility for our own hearts and love each other as Jesus loves us.